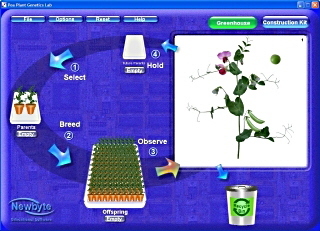 Perform Mendel’s famous genetics experiments and more! 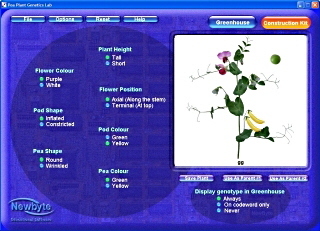 Students breed, count, categorize and record each pea plant, just like in Mendel’s famous experiments, making this an essential science tool. In addition to the wild type, there are 9 mutant genes that may be selected. 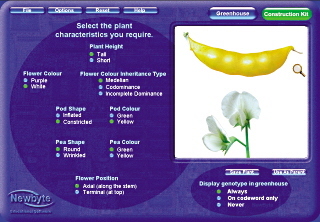 The mutant genes affect the structure of the plant structure, flowers, pods and peas the pea plant. These characteristics can be clearly seen with the superb graphics. Unlimited generations of peas may be bred. Pea plants may be saved and reloaded. The optional auto-count enables full experiments to be completed in minutes. Single gene, Double gene, Triple gene, Incomplete Dominance, Codominance.